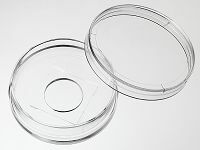 35 mm glass bottom dish, dish size 35mm, well size 14mm, #1 cover glass(0.13mm-0.16mm). D35-14-1-N , request a free sample or get a quote. Quote: "Coat glass-bottom, 14-mm aperture, 35 mm culture dishes (In vitro Scientific D35-14-1-N) with 0.01% (w/v) poly-l-lysine (PLL) (Sigma P8920) supplemented with 1 mg/mL fibronectin"
Quote: "Materials. 35 mm Glass bottom dish with 14 mm micro-well #1 cover glass, In Vitro Scientific, D35-14-1-N"